If you’re like most college students, you’re probably wondering how you can afford all of the costs associated with getting a post-secondary education. Fortunately, there is a wide range of resources available to help pay the costs of attending a degree program. Scholarships, which are essentially free money for school, can be a great source of assistance for those who are seeking student financial aid. There are thousands of scholarships available, sponsored by organizations ranging from academic institutions to local churches and community groups. Scholarships may be awarded based on merit, such as athletic ability, academic excellence, or even on competitions such as writing or science contests. Because there are so many scholarship options available, you will need to do some homework in order to find those for which you may qualify. The best place to start looking for scholarships is in your high school career guidance office. You can find online publications and scholarship databases which list thousands of scholarship programs. Some of the organizations which may offer scholarships include colleges and universities, community volunteer programs, municipal groups in your area, your place of worship, your after-school job, and the companies where your parents work. Many students need help paying for college. With the costs of higher education rising every year, some students simply aren’t able to pay for tuition, fees, room, and board without additional assistance. While there are other financial aid options, such as college grants, student loans, and work-study programs, many students seek additional help in the form of scholarships because they don’t have to be paid back. There are many different types of scholarships available that will cover everything from the cost of text books all the way up to the entire cost of tuition. Typically, scholarships fall into one of two categories – need-based and merit-based aid. A need-based scholarship is, as you might expect, based on your demonstrated financial need. This type of scholarship may be offered by your college, a community business, a private individual, or an organization. While your academic history may be taken into account, the deciding factor is your need for financial assistance. In today’s economy, many parents don’t have the funds available to help their children pay for college. However, these same parents may make too much to qualify for assistance from the federal government. Need-based scholarships help to cover this financial gap. Usually, the financial criterion is not as strict, or the scholarship was created to specifically help students who don’t qualify for governmental financial aid. There may be other requirements, however. Even if you qualify financially for a particular need-based scholarship, you may have to maintain a certain grade point average or be enrolled in a specific field of study in order to receive funds. Other need-based scholarships may be available only to members of certain demographic or racial groups. The financial criterion, however, must be met first. To find out if there are any need-based scholarships that you might qualify for, speak with the financial aid office at your school. Many times, these counselors will know of certain need-based scholarships that aren’t known to the public. 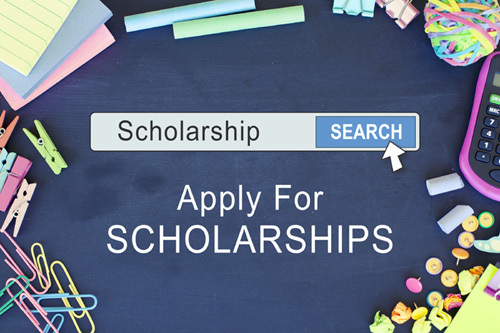 There are also many websites today that are dedicated solely to helping students find scholarships that they may qualify for, so plan on spending some time online researching with your favorite search engine. Unlike need-based scholarships, merit-based scholarships aren’t based on financial need. These scholarships are awarded to students who have excelled in academics, athletics, volunteerism, leadership, or other areas. Typically, the granting organization will be a college, individual, business, or other organization. Some schools offer merit-based scholarships that function as discounts on tuition and fees. Studies have repeatedly shown that students are much more likely to attend a school that offers them a merit-based scholarship, rather than one for financial need. Therefore, many colleges are now using merit-based scholarships as a way to entice talented students. Some colleges will award this type of scholarship based solely on a student’s application for admission. However, others will require a separate scholarship application to qualify for these awards. Check with the financial aid office at your chosen college to see what you need to do to be considered for merit-based scholarships. Some scholarships for merit are awarded automatically. For example, a school may choose to award all incoming freshmen who were valedictorians or salutatorians at their high schools a monetary scholarship. Other scholarships are more difficult to get. As you search for scholarships, you’ll find some for those who excelled in drama, music, or art, and others that are awarded based specifically on gender or ethnic background. To increase your chances of getting a merit-based scholarship, you should apply to schools where your academic record or other achievements stand out. A GPA of 3.0 may not be considered outstanding at an Ivy League school, but could qualify you for a merit-based scholarship at a state program. High test score, high class ranking, athletic talent, and ethic diversity can all help you qualify for certain scholarships. Finally, it’s important to remember that if you qualify for merit-based scholarships, you may lose your eligibility for need-based aid. Usually, scholarships will replace work-study and loans in your financial aid package, but if the award is big enough, it may also replace some of your need-based grants. If the scholarship isn’t enough to cover all your fees on its own, you may still need to seek out other funding sources to cover your remaining balance. Earning scholarships is a great way to earn money for school, but don’t think it will be easy – some scholarship applications may seem harder to complete than taking a final exam. The most important thing to remember is to read the directions carefully. Many students won’t qualify for a scholarship just because they didn’t complete the application correctly – meaning all their hard work was for nothing. Typically, you’ll be expected to complete one or more essays and provide personal recommendations and transcripts to apply for many of today’s scholarships. Writing scholarship essays can seem like a very daunting task to many students. However, if you follow a few simple tips, you can make the process much easier. First, make sure you understand what the scholarship committee wants in the essay. If the topic asks a question, be sure to answer it completely – don’t deviate or wander off topic. For example, if the essay topic relates to your specific to a field of study, make sure your essay covers this topic – not your unrelated volunteer efforts. While excellent writing skills will certainly benefit the student, the content of the essay is just as important. Make sure your essay is free from grammatical, spelling, and punctuation errors. Have a teacher or family member proofread your essay to help you with any potential problem areas. You want the essay to be one of the highlights of the scholarship application, not an error-filled distraction. Most scholarship applications require that one or more letters of recommendation be attached. A scholarship letter of recommendation sings your praises but in a very professional manner. The letters are intended to show the scholarship review committee that there are people in the community who are familiar with your personal characteristics and your talents and abilities and are willing to put their support in writing. For many people, filling out the scholarship application and even writing an essay is the easy part. The hard part is finding just the right person who will write a scholarship recommendation letter in enough detail to make it a valuable resource for your application. The person must know you well enough to know that you deserve this scholarship and will make good use of the money academically. The first step is deciding which scholarships you want to apply for so you can read the guidelines. Often the guidelines will ask for specific information to be included in the letter like the writer’s association with you and qualities you possess that make you the best candidate for a particular scholarship. In other cases there are no content instructions. When asking someone to write a scholarship recommendation letter, you want to give some guidance. This not only helps you get a letter that is focused on the scholarship you hope to land, but the writer appreciates the information because it makes the writing job easier. The letter should come across as thoughtfully prepared. Statements supported by facts are worth their weight in gold. For some reason people tend to be somewhat shy about asking for letters of recommendation for scholarships or grants. The reason is probably due to the fact that you are asking someone to do some bragging about your sterling characteristics. The key is to ask with a humble attitude and let the person know it will take some time and effort, and you’re very appreciative. You should also supply as much information about yourself as possible that is useful for writing the letter. The goal is to ask for letters from people who will be recognized as reliable and respected. A well written letter can make your scholarship application stand out in the crowd. Anything you can do to make your application more competitive is exactly the right thing to do. Scholarships are a terrific way to get free money for your college education. Contact your financial aid office to begin your search, but also check with other sources, including online sites, community organizations, and local businesses. Pay close attention to the requirements for each scholarship and take the time to complete the application correctly. If you need to write an essay, pay close attention to the instructions and have some proofread it for you. Also, make note of the deadlines for each scholarship, so you don’t miss out on a great opportunity.